Notification relieves the agent the stress of mentally tracking appointments. OTRS appointment notifications satisfies this need. Here a person can easily set notifications with general rules, including trigger events and filters. Afterward, appointments fitting the bill notify the correct users at the correct time. Use this screen to add appointment notifications to the system. In a fresh OTRS installation an appointment reminder notification is already added by default. 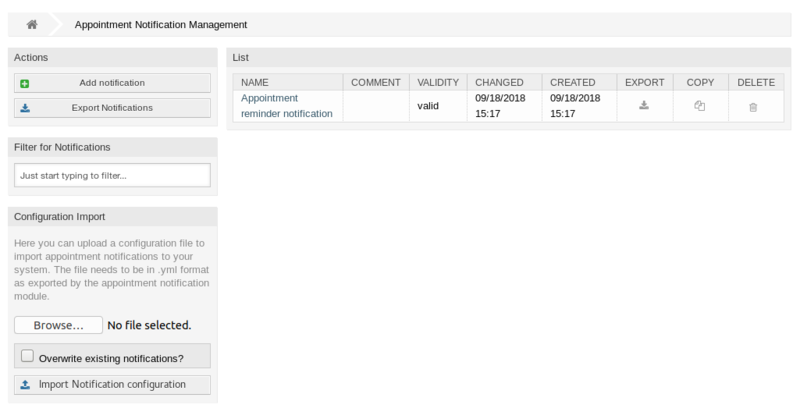 The appointment notification management screen is available in the Appointment Notifications module of the Communication & Notifications group. Fill in the required fields as explained in Appointment Notification Settings. Click on an appointment notification in the list of appointment notifications. Modify the fields as explained in Appointment Notification Settings. Click on the trash icon in the list of appointment notifications. For an example, see the default appointment reminder notification which is included in a fresh OTRS installation. Here you can choose which events will trigger this notification. An additional appointment filter can be applied below to only send for appointments with certain criteria. Executed after an appointment has been created. Executed after an appointment has been updated. Executed after an appointment has been deleted. This is a special appointment event that will be executed by the OTRS daemon in time. 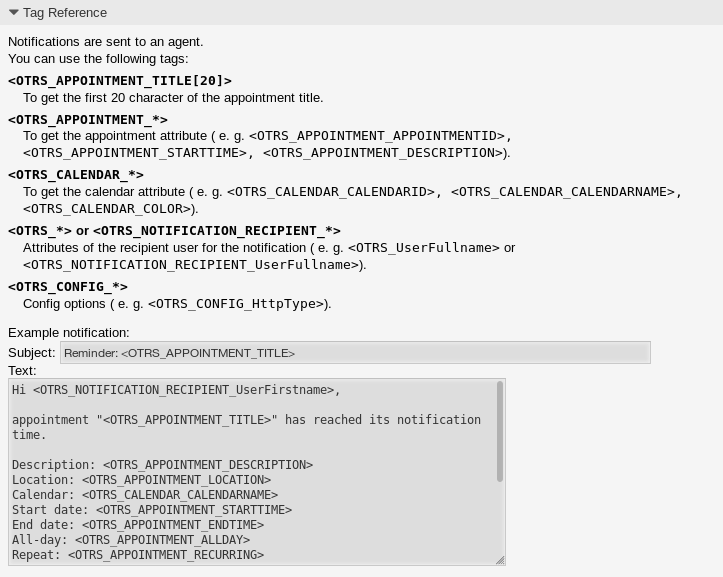 If an appointment contains a date/time value for notifications, as already described in this documentation, and such a notification date is reached, the OTRS daemon will execute this kind of event for every related appointment separately. Executed after a calendar has been created. Executed after a calendar has been updated. Select which calendar the related appointment needs to be part of. Filter for a part or complete title of the appointment. Filter for a part or complete location of the appointment. Choose from a list of teams or resources assigned to the appointments. Notify users just once per day about a single appointment using a selected transport. For example, the variable <OTRS_APPOINTMENT_TITLE> expands to the first 20 characters of the title allowing a template to include something like the following.